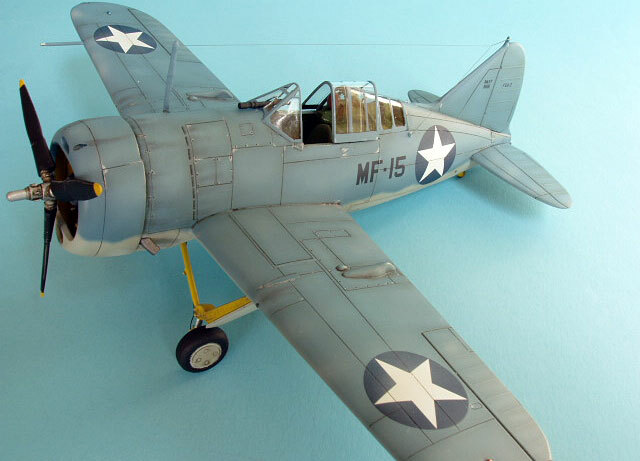 This is Special Hobby’s recently released 1/48th scale F2A-3 Buffalo. 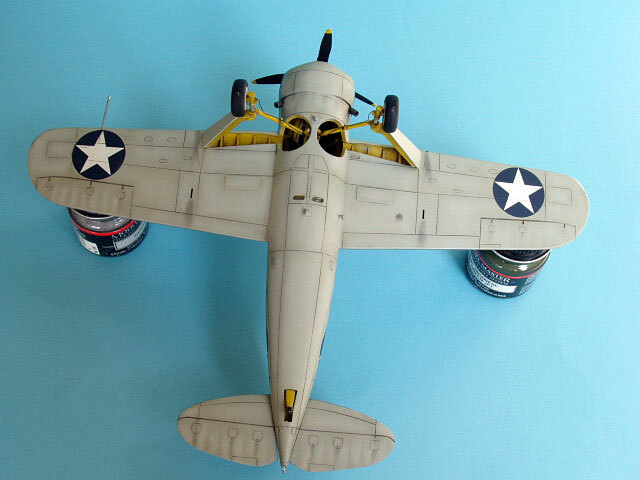 This kit is identical to the Classic Airframes F2A-1 Buffalo, sharing all sprues, PE and resin except with the Special Hobby version, you get the longer fuselage of the –3 and, of course, different decals. The Buffalo goes together very well for a limited run kit, with only one “GOTCHA” to watch out for. The instructions have you build up the main wheel wells, the engine and most of the cockpit on top of the assembled wings, then you put each fuselage half on top of the wings and around the wheel well/engine assemblies and then you glue the fuselage halves together and to the wings. A different sort of procedure, but the only way I could see to do the more conventional thing of gluing the fuselage halves first and then attaching it to the wings was to leave off the engine assembly. Things were going very smoothly up to this point, so I stuck with the kit instructions, and things seemed ok…until I put the cowling on the front of the fuselage. The engine sat so far back, the propeller shaft just barely stuck out past the cowling… DOH!!! The solution was simple; detach the engine mount from the bulkhead and pull the engine forward. Sure, if you look way up in the wheel well, you may notice that there’s a gap between the engine mount and the bulkhead, but that’s a whole lot better than having the prop pressed up against the cowling, right? So, what caused the problem? 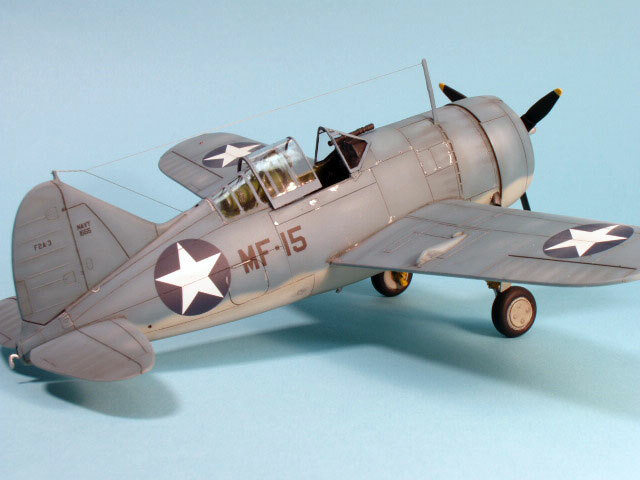 Well, my best guess is, since this kit is the Classic Airframes –1 Buffalo with the longer –3 fuselage, the engine mount must not have been lengthened to match the longer fuselage. Following that little hiccup, the rest of construction went smoothly. First I preshaded the bottom with brown and the top with black. Then I sprayed the bottom with Model Master 36440 Light Gull Gray followed by a a lighter shade of gray sprayed in random areas underneath. Next, I sprayed the top with Model Master 35189 Blue-Gray. I followed that with a random pattern of the Blue-Gray lightened 5% sprayed on the sides and some of the upper surfaces. Next came another random spraying on the upper surfaces of Blue-Gray lightened by 10%. 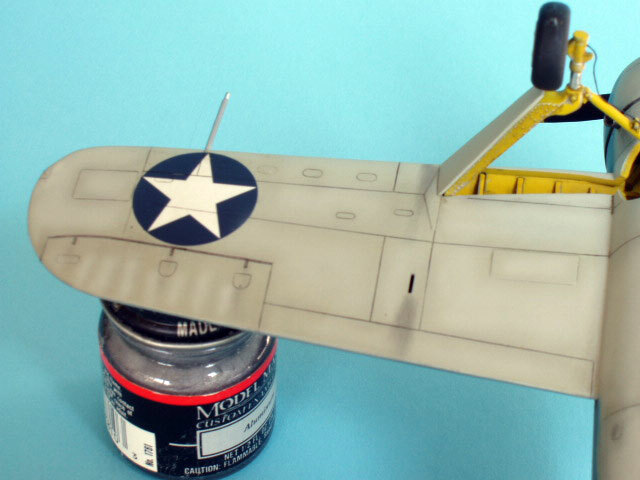 Next was gloss; decals (which are excellent, by the way); gloss; an oil wash of black/burnt umber; a very light, thin misting of Light Gull Gray on random upper surface areas; some chipping with a silver pencil; and finally, different shades of gray pastel chalk brushed across appropriate areas.